“Twenty years in the same workspace and the items tend to collect into small noisy crowds on all the available surfaces. I collect things because I like drawing them. 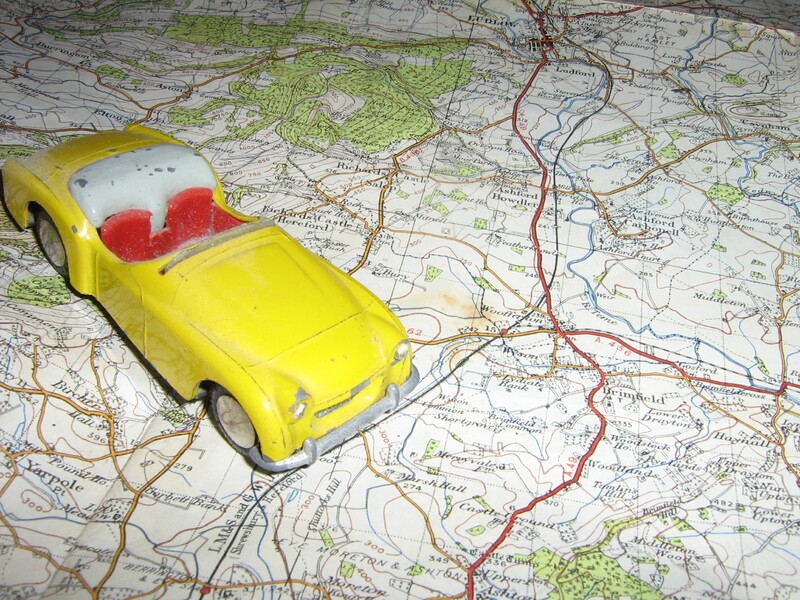 If I’m asked to do an illustration of a car, for instance, I will probably look at a toy car. I have a lot of these around my office, some of them from when I was a kid and my dad brought Dinky Cars home for me from business trips. 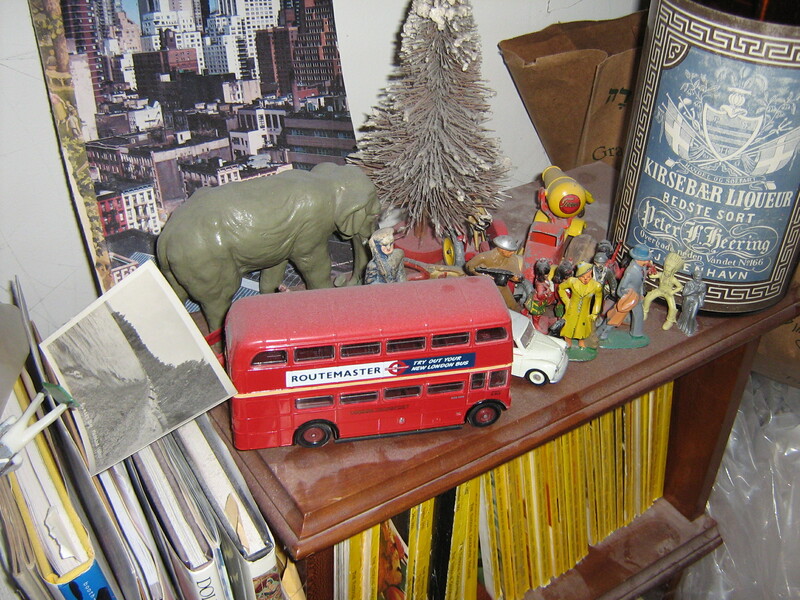 I also collect lead figures, tintoys, postcards, snapshots, old Michelin maps, old ordnance survey maps, English transferware, old pencils, cricket balls, flags, artificial birds, and lots of books. I began collecting old books in my teens. I’ve never erased the prices in the endpapers. Books I collect: old Penguin and Albatross paperbacks, illustrated books, books with illustrated endpaper maps and old Baedekers. I’ve explored parts of Europe with a hundred year old Baedeker’s guide in my pocket. Illustrated maps are a specialty, so it’s nice to have plenty of interesting atlases and maps handy. I used to do the maps of wine regions for Gourmet magazine and humorous maps for Spy. Books are everywhere in our 110 year-old house, stacked along the walls, on shelves. They are excellent insulation. They are a buffer against the vicissitudes of life. My work is my life, and my home is my workspace. For the past 25 years I’ve done my illustrations at an old drafting table, but since my images are small most of the table is covered with other stuff, either my own art which I look at for reference, for color ideas especially, or with art books by artists I admire: Ben Shahn, Marvin Friedman, William Steig, Ronald Searle, Eric Ravillious, Edward Bawden, David Stone Martin, Pont, M Sasek, Saul Steinberg. I also have a bookcase full of National Geographics from the 40s through the 60s, inherited from my grandfather. They are excellent reference, especially because I have a useful index. My drawing surface. There is a small masonite board at the lower left extremity of my table. Above it is my paintbox and the ceramic palette I happen to be using. I use an old enamelware cup for water and various cans and baskets to hold paint tubes and brushes. Scissors and pliers and other tools to hand. I used to use a crowquill pen but now do my line with a brush or with pencil. To the right of my drawing board is one of those wire dinguses that hold a dozen or so pictures or postcards, an antique flat file that has my old pencil drawings in it. 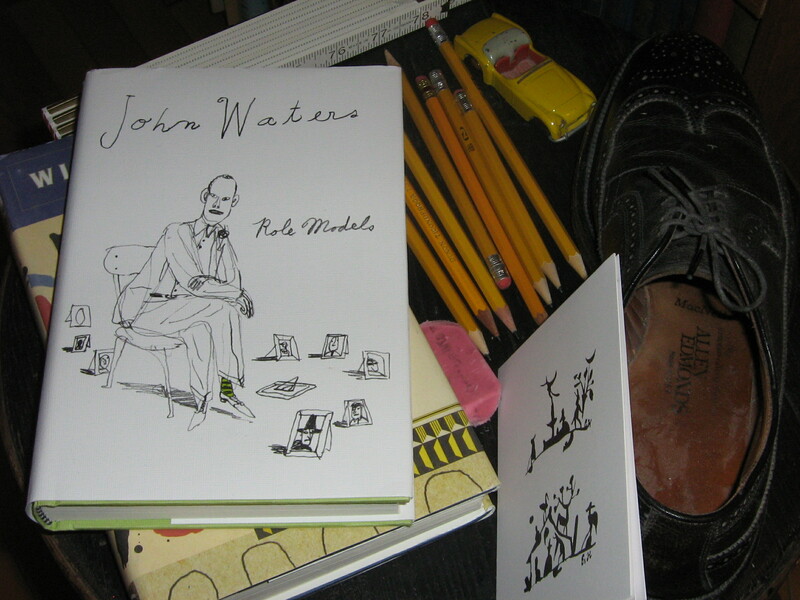 I’m glad I’ve held onto them.Since doing the book cover for John Waters’s memoir last year in pencil I’ve found a new way of pushing the darkness of the pencil line and adding color to it. I am always changing the way I work. The items tend to collect into small noisy crowds on all the available surfaces. I collect things because I like drawing them. Illustrators work whenever they are paid to. But I draw and write whenever I have an idea. 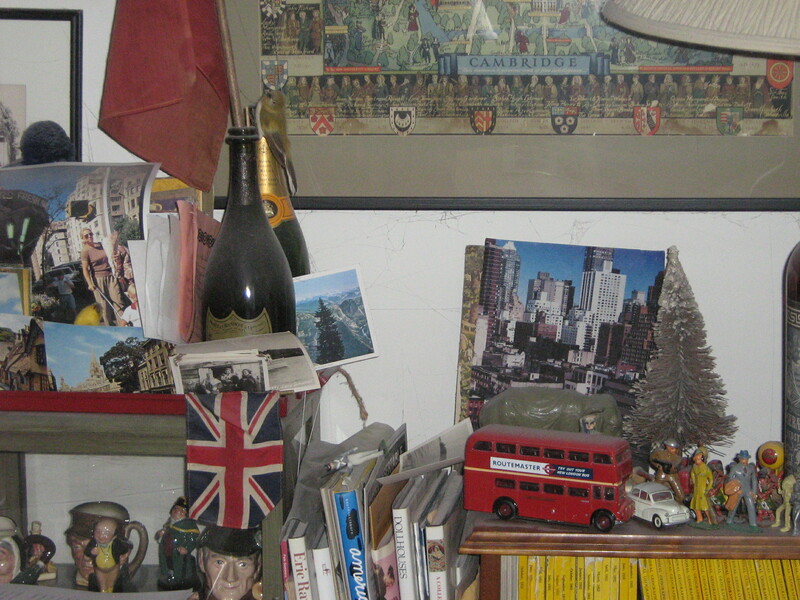 I especially like working in the armchair by the bookcase in the living room. What’s nice about working in a room other than my office is I pick everything up at the end of the day. And I don’t feel like a hermit. Dickens used to write during parties with guests around him. I don’t do that, but my work is always present at least in my head, which is all right. 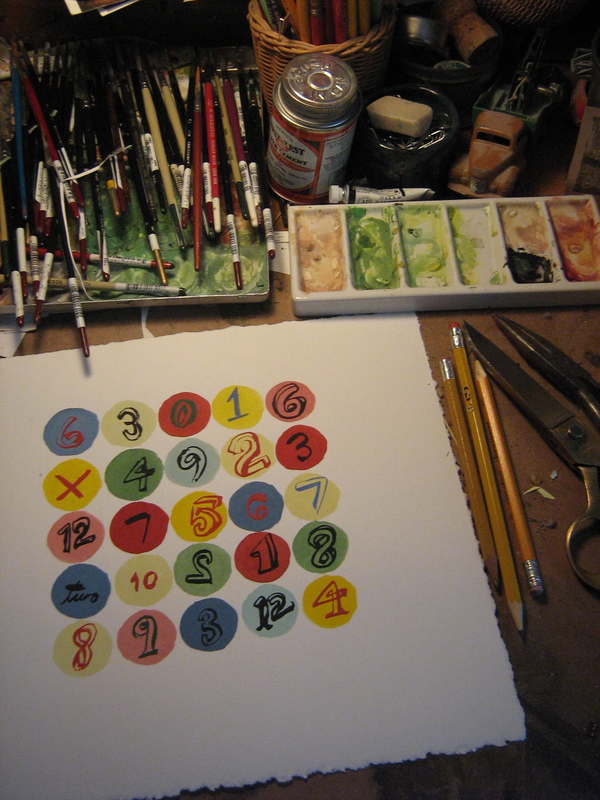 I like to be able to draw in the evening or work on a story without banishing myself. I have heard about other artists who keep an office elsewhere, put on hat and coat and leave home every morning “for the office.” I am not like that. My work is my life, and my home is my workspace. Eric Hanson’s illustrations have appeared in The New Yorker, Vanity Fair, The Atlantic, The New York Times,the Los Angeles Times, House & Garden, Gourmet, Time magazine, Kiplinger’s, Bloomberg, Travel & Leisure, Outside, Wig Wag, Spy, The Believer, Rolling Stone and other publications. Design and advertising clients include Aesthetic Apparatus, Duffy, Robert Valentine, Fallon, Ronn Campisi, Tolleson, Philographica, Chiat Day, Target, Atlantic Records, Neiman Marcus, General Mills, Xerox, Miss Porter’s School, Vail Ski Resorts, USBancorp, Honda, Graphique de France, Marshall Fields and others in North America, Europe and Japan. He has designed product lines for Pottery Barn and illustrated books for Knopf (the Chic Simple series), Chronicle, Random House and Pantheon. His fiction is published inMcSweeney’s. Original Eric Hanson art is available through the artist. 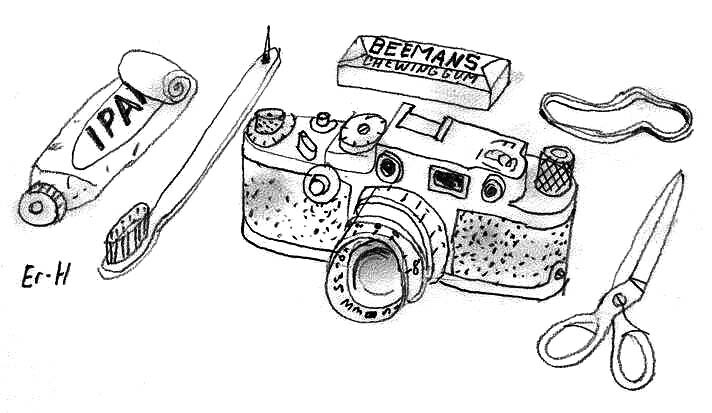 I like doing still life arrangements of things. The more ambiguous their association the more the mind tries to make that association. This is how I arranged the material in my book. Adjacence is important. I do this in my short fiction too. The thing that is out of context tries very hard to become a metaphor for something else. If something pops into my head while writing I try to incorporate it; I assume it showed up for a reason. These still lifes of ordinary things appear random but are they? 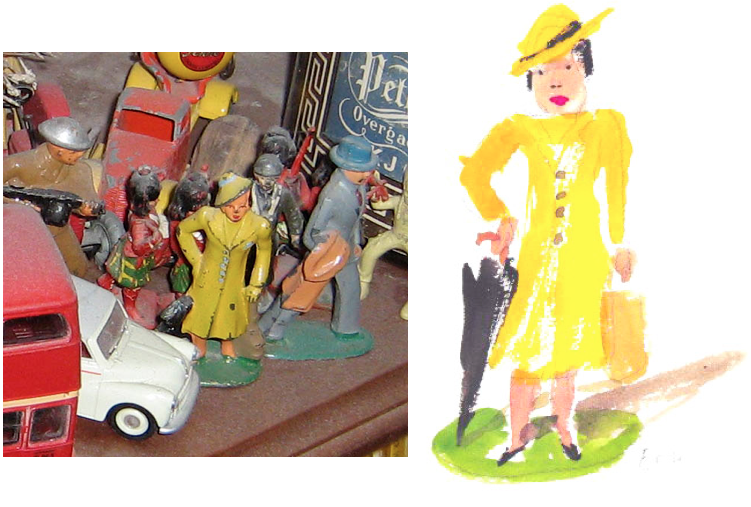 I painted this pencil drawing of a small cast lead figure of a woman in a yellow raincoat, which I also bought at an estate sale. This style won some notice from AIGA, SPD, Communication Arts and American Illustration but didn’t make many inroads in print, being so subtly detailed and so offhand, but it did lead to this new pencil style 15 years later. This painting hangs in our main floor bathroom. 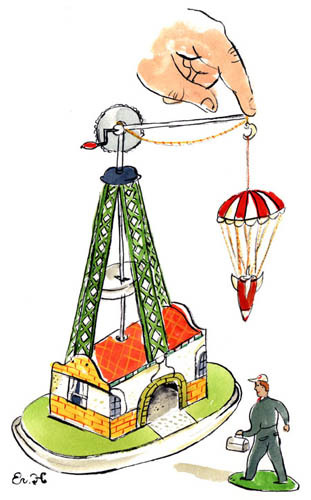 This is an example of a tintoy metaphor. I construct metaphors to explain events and dynamics in economics, politics and life, using various familiar artifacts and inventing variations on them. There is no tintoy factory with a rocket you can drop on an unsuspecting factory worker. I invented this to describe how surprised and hurt workers might be if they retired and found their pensions had been used for other purposes. It’s a portfolio piece. 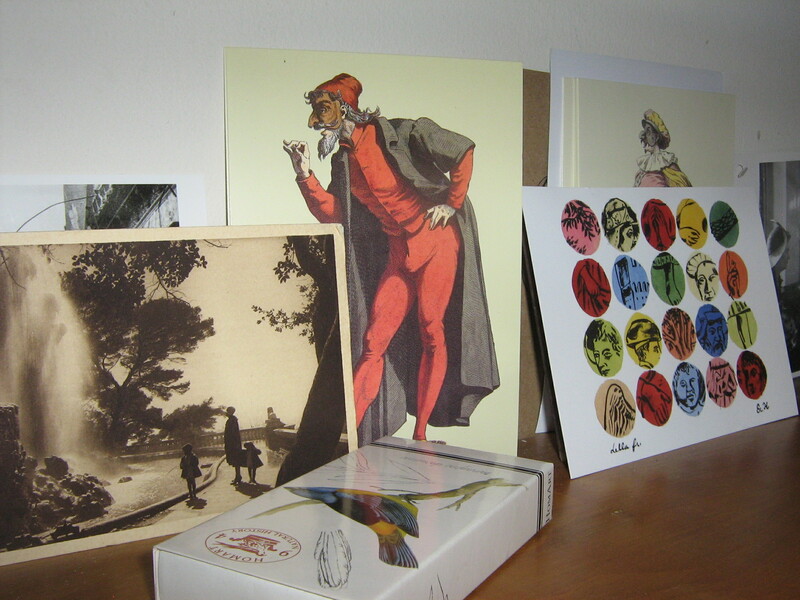 FROM YOUR DESKS: Your space is a history. 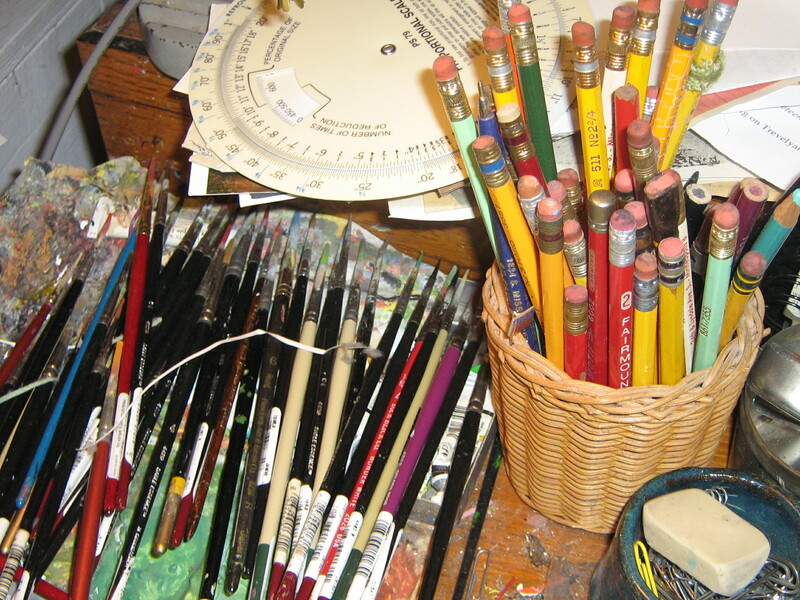 Did your parents keep items around their home; were they artists in their own right? ERIC HANSON: My dad worked for the same company all his life. He sold the frozen food packaging to Green Giant and Pillsbury. 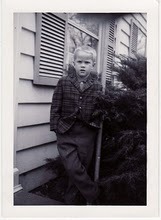 Our house had lots of antiques and books at a time when most suburban homes had Danish modern and a large TV. Some of their things still have an iconic status with me. They are in their 80s and show no signs of downsizing. I wrote an article a long time ago about how I attended estate sales looking for the things my parents and grandparents weren’t in a hurry to bequeath me. 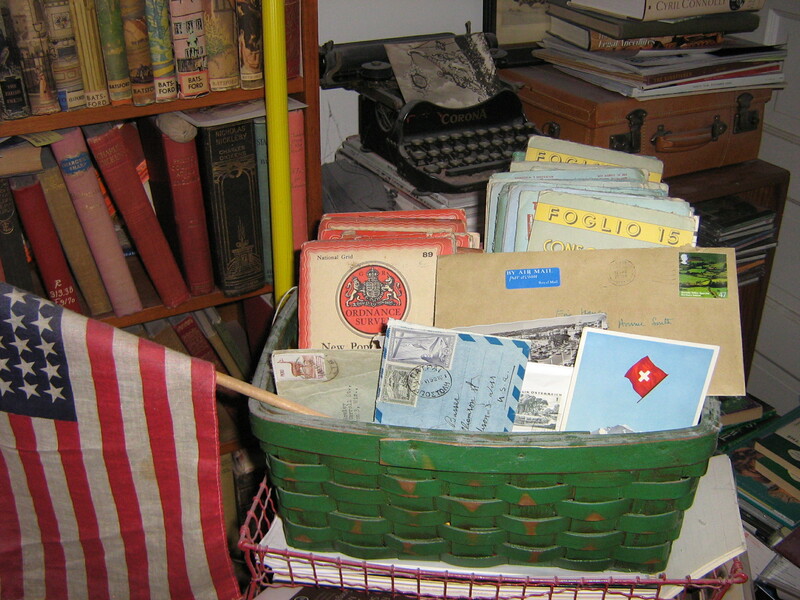 Antiquarian bookstores and estate sales appear often in my fiction. EH: I used to be more sentimental than I am now. For irony or cynicism to mean anything you have to have a basic sentimentality, otherwise there is no edge to it. The one is the sand, the other is the oyster. Waugh is my favorite author, a bitter satirist with a deep sentimentality. I find his sentimentality embarrassing. It’s a private emotion. FYD: What is the difference between drawing and writing; do they bring about the same pleasure? EH: My stories tend to spring from a mechanical idea, a turn of plot or a shaping metaphor. My best drawings are based on a metaphor, but I also draw things as things, just as I write descriptively when I am writing about travel or about places. I like drawing architecture. I wanted to be an architect until I almost flunked calculus. 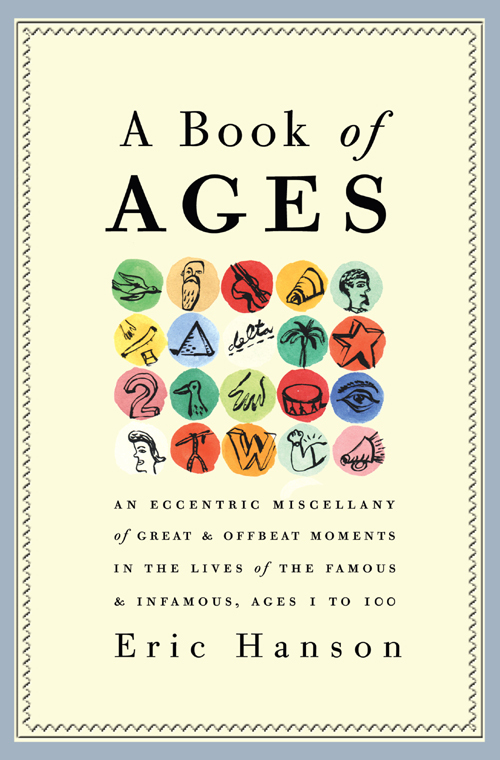 FYD: Did being around your book collection help you organize A Book Of Ages? What are some of your favorite facts (or amusements) from the book? EH: I have a lot of useful miscellanies, biographies and reference books and they were useful when I was writing A Book of Ages. But many of the small facts and anecdotes I collected were from articles in the New Yorker, Rolling Stone, the New York Times Book Review and other periodicals. I read a lot of obituaries. The Daily Telegraph has the most gossipy obits, and that was what I wanted. Offbeat material. This was a lot easier once I was able to go online to find things. One person would make me think of another: Dorothy Parker would make me think of Robert Benchley or Claire Booth Luce. Buffalo Bill would make me think of Annie Oakley. One rock star anecdote would remind me of another and I’d go find the details before I forgot. I kept notes in a shoebox until I had a laptop to use. Just like the still lifes of adjacent objects I keep around me, it’s the arrangement and juxtapositions that make the book funny and ironic. The anecdote about Paul Newman discovering he’s on Nixon’s enemies list follows some self-important deed of Nixon’s. E.B. White’s writing of One Man’s Meat is followed by the famous Johnny Carson incident with the tomahawk. The retirement of Casanova to his librarianship in Bohemia is adjacent to a story about Sir Mick Jagger. Some of my favorite bits are about Laurence Sterne, the author of Tristram Shandy, a very funny and sexually charged novel nobody reads anymore. The context of other anecdotes gives additional zing to the double entendres. Each entry is very brief but if they are arranged carefully they contain additional meaning from the previous story you are still thinking about. For irony or cynicism to mean anything you have to have a basic sentimentality, otherwise there is no edge to it. FYD: How did the John Waters book jacket come about? EH: I’d been sending things to Susan Mitchell over the years. I can’t remember which piece it was that made her pair me with this project. I read the book and started sending drawings out to her. She picked number 20-something, which John liked too. 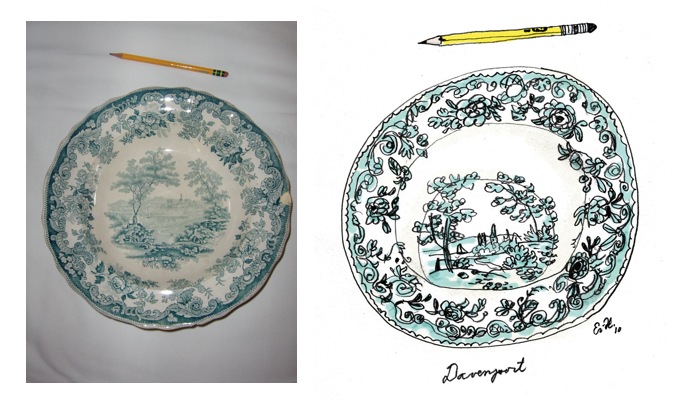 So I painted it, and John said he liked the pencil better. The pencil was really rough, so I redrew it a bit neater, and he said he liked the rough one better so that’s what they used. They darkened the line a bit more than I had. I began working in pencil line a lot more after that. FYD: Outside your own work, what is a day off like at the Hanson house? How do you relax? EH: I’ve worked the past two weekends so I’m thinking of taking this weekend off, but I will probably work on a novel I’ve been writing. At least some. I don’t like watching films during the day, but I sometimes do on Saturdays. Last weekend I watched W. C. Fields and an early Hitchcock. I am reading William Boyd’s Any Human Heart, but when I am reading a really good book it usually makes me want to write. This is a complete delight.